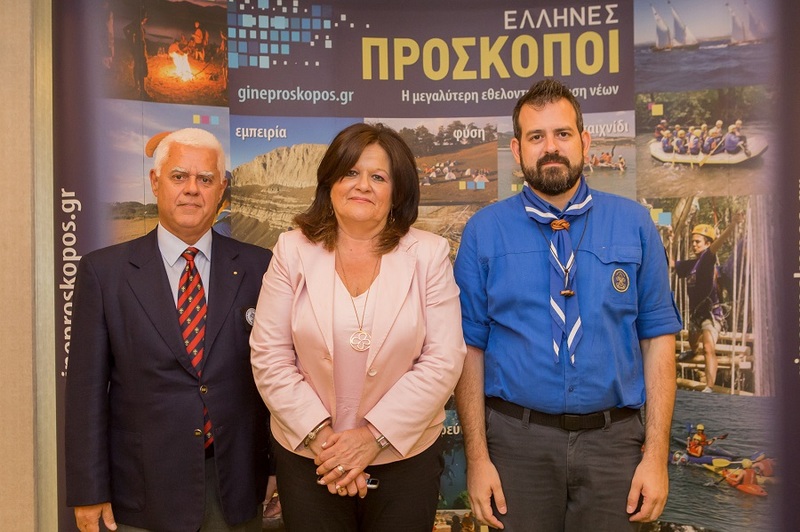 The national survey "The views and positions of Greek Youth during the period of the financial crisis ", which was carried out on the initiative of Soma Hellinon Proskopon (the Scouts of Greece) by ALCO polls, was presented on Thursday June 14, 2018, at New Hotel in Athens. The survey was conducted nationwide among young people aged 17-29 years old and aimed at studying what are young people’s expectations, aspirations and values, how they set their priorities and expressed their level of trust towards the various institutions within the country. The impact of conflicting emotions on Greek youth was captured. Young people in Greece seem to be trying to overcome insecurity and frustration in order to keep alive hope and optimism. It is very important that the expectation index is positive (54%) and that positive feelings predominate over the negative ones (especially among young people of age 15-16 and 17-20 year old), but the intensity of disappointment and negative emotions is greater than desired. 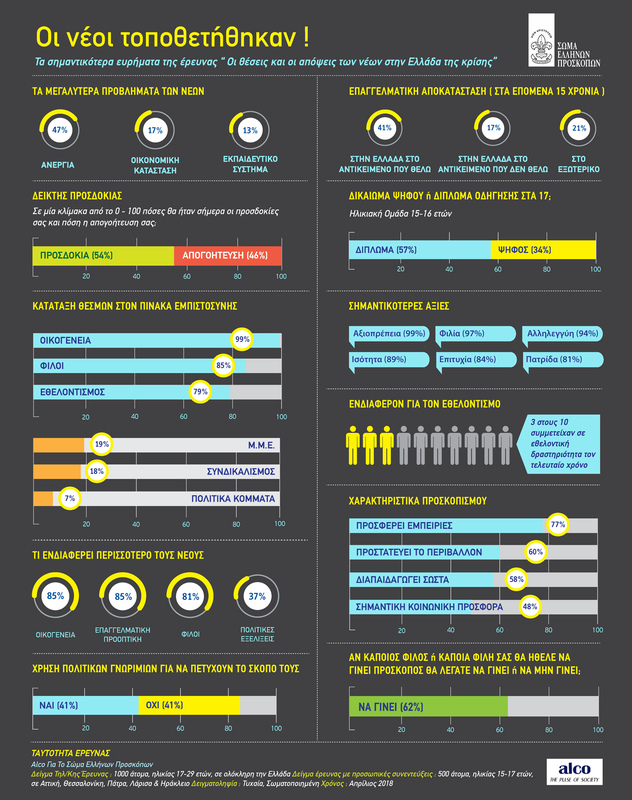 Greek youth is characterized by an anthropocentric approach / perception. Both in terms of values (where dignity, friendship and solidarity prevail) and at the level of priorities that are set (where personal life and friends outweigh professional perspectives and rights); it seems that at the core of youth’s social approach are the interpersonal relationships (potentially as an counterweight to high insecurity and uncertainty), with the professional prospect and the pursuit of success following in equally high rates. It confirms, once again, the low trust of the youth in the political system. The only institution that young people trust completely is family, while at the same time the rates for volunteering are very positive and marginally positive regarding the armed forces. On the contrary, political parties, parliament and trade unions come last in the ranking with very high negative rates. An important point that stands out is young people's perception of the political system; the majority of those aged between 15-20 consider more important to obtain a driving license at 17 than the right to vote at the same age. Positive attitude of youth towards volunteeerism. On theoretical level volunteerism has a high rate of credibility, a finding that is confirmed by the equally high rate of participation in volunteer activities, mainly by women and young people aged 21 to 29, and by the good knowledge of several voluntary organizations. Scouting is highly regarded by young people mentioning that they appreciate its values and its usefulness in society. 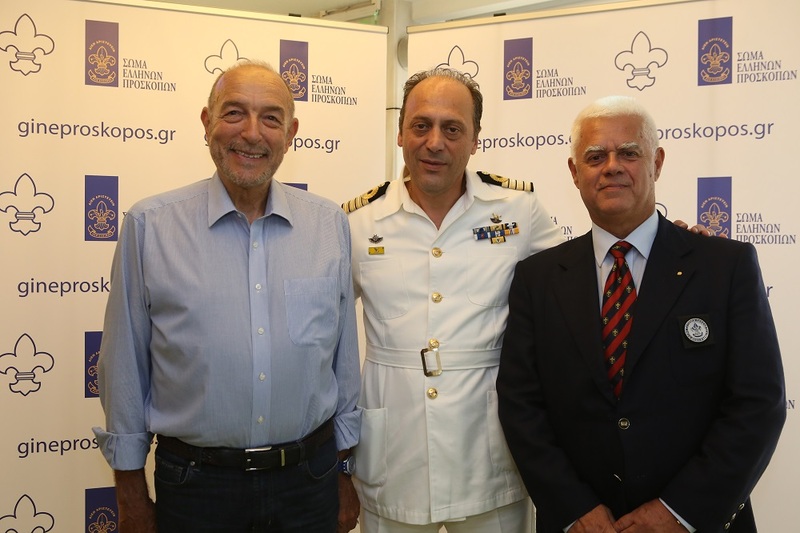 The Chief Commissioner of Soma Hellinon Proskopon (Scouts of Greece), Mr. Christoforos Mitromaras, in his brief greeting thanked the President of the Hellenic Parliament Mr. N. Voutsis for his confidence and support of the Greek Scout’s initiative to carry out this survey focused on youth. He concentrated on the educational role of the Scout Movement and gave particular emphasis to the life skills that young people acquire and develop through Scouting. 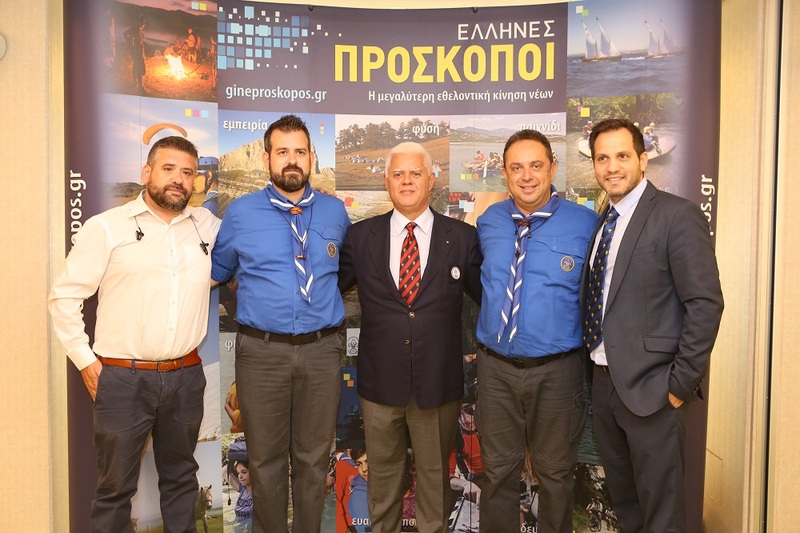 The Chairperson of the National Board of Soma Hellinon Proskopon (Scouts of Greece), Mr. Isidoros Kanetis, referred to the conclusions of the research that will be an important aid to all those who are directly or indirectly involved in youth work and how they will be taken into consideration when developing the Youth programme in Scouting. 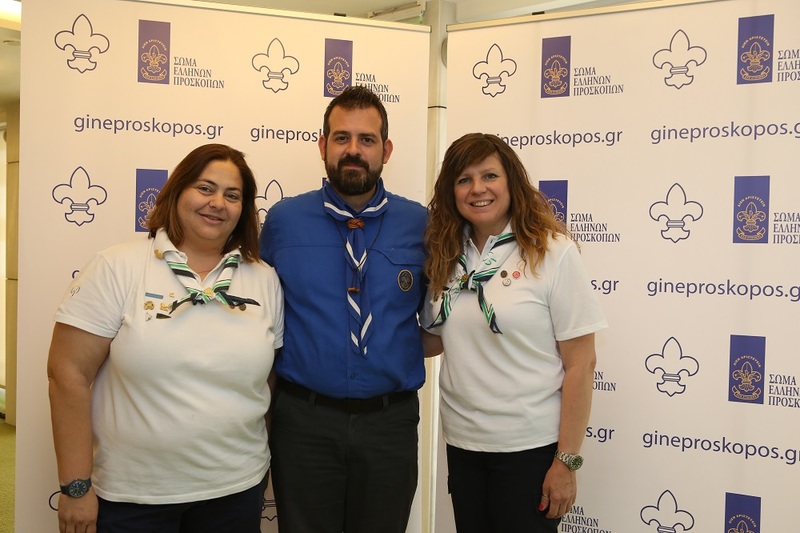 Mrs. Hara Kafantari, spokesperson of the Hellenic Parliament, in her greeting stressed that her presence at the event was guided not only due to her official position in the Parliament but also by personal reasons, since she and her children have been members of the Scout family. She referred to the values and skills with which Scouting invigorates all of its members and emphasized on the unique experiences that young people obtain through Scouting, which accompany them throughout their lives. 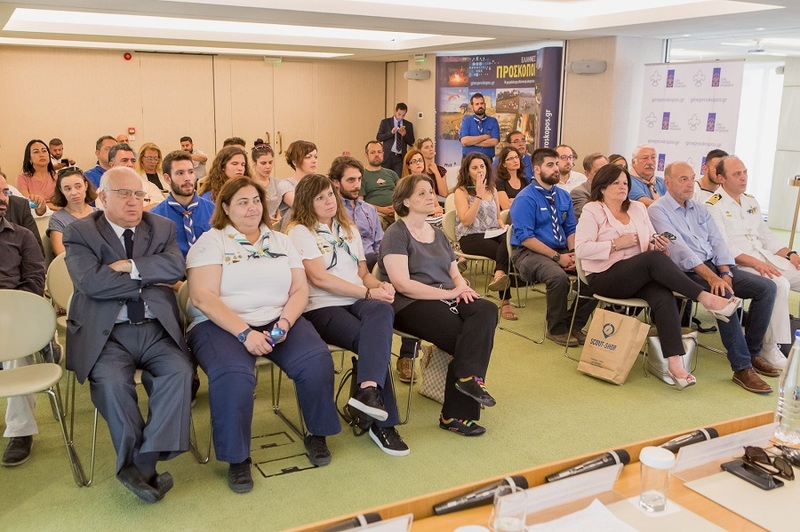 Finally, she stressed the importance of listening to young people and congratulated the Scouts of Greece who, through this initiative, contributed by recording their expectations and perceptions. The presentation of the results of the survey on youth was attended with great interest by journalists, representatives of civil society organizations and businesses and members of Soma Hellinon Proskopon.